What could possibly go wrong ith over-the-air HDTV recpetion? The above photograph is a prime example for improper channel selection. Channel 29, WFME-DT is squeezed in between two powerful DTV stations! Instead of dissecting confusing details of dBmV, dBu and dBuV readings, or validity of the 41 dBu/meter noise limited fieldstrength threshold, let us just follow the path of the received HDTV signal. The Channel 29 spectrum, accompanied by those two strong adjacent channel interference signals, will pass the HDTV receiver’s tuner, hitting the RF mixer. Due to the tuner’s meager selectivity the RF mixer will not be protected against the high amplitude adjacent channel carriers, creating second and third order distortions, affecting picture quality. However, that is not the end of the story. 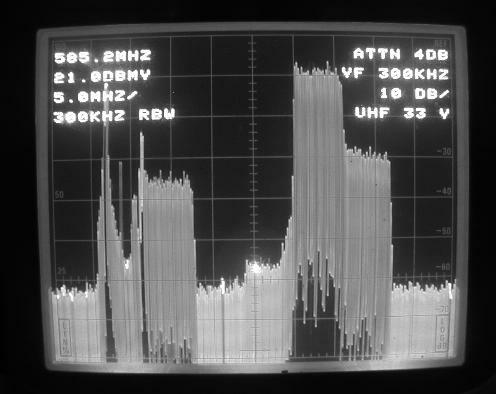 Another, frequently disregarded factor is the sideband splatter of the DTV transmission, as shown on the picture below. 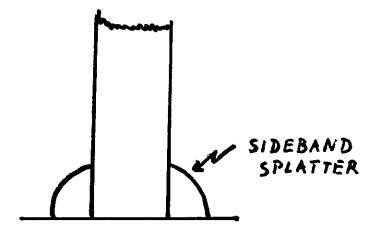 The sideband splatter will increase the noise floor of the desired channel. Of course, when the desired channel is squeezed in between two high amplitude 5.5 MHz wide power spectrums, the third order distortion, as well as the noise floor will be much higher than that due to only one adjacent channel carrier. 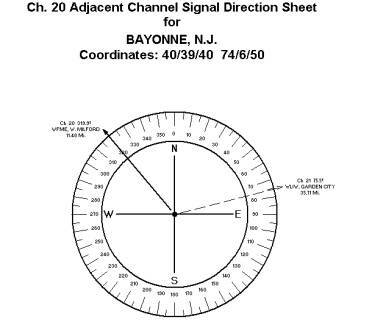 The Signal Direction Sheet above demonstrates unfavorable Channel 29 reception conditions in Bayonne, N.J. as documented by the photograph, taken from the screen of spectrum analyzer. The undesired adjacent channels are 25% closer than the desired Channel 29. A computer aided channel search was performed to find a clear channel. 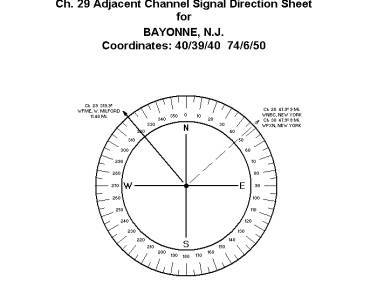 The results are presented on the signal direction sheet below. By switching to Channel 20, reception conditions became free of adjacent channel interference. Only one adjacent channel was found, and because of the distance being three times further than the desired, it should not generate any intermodulation products. The selection of Channel 29 was a mistake. The station was ill advised by counsel and broadcast engineers. Biro Engineering’s computer aided channel selection study, available on short notice, could have saved a lot of aggravation for the station, ascertaining improved reception conditions. HDTV reception failures are radically different from those experienced in receiving analog VHF and UHF stations. With fading analog signals pictures sink gradually into noise, accompanied by reduced quality sound. Should the received HDTV signal pass the edge of the digital cliff, the results, without warning, will be a total loss of picture and sound. 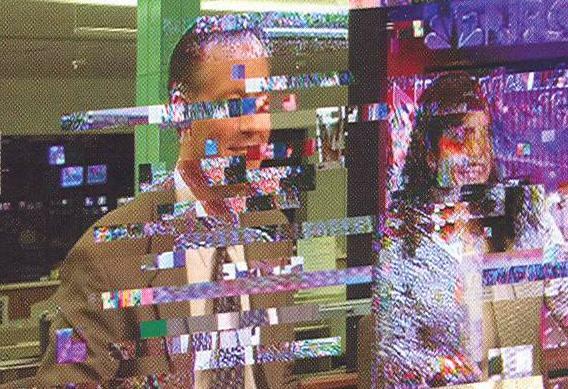 (Occasionally, as a precursor, pixelation or freezing of the pictures may occur, which is just as unacceptable for the CATV subscriber). 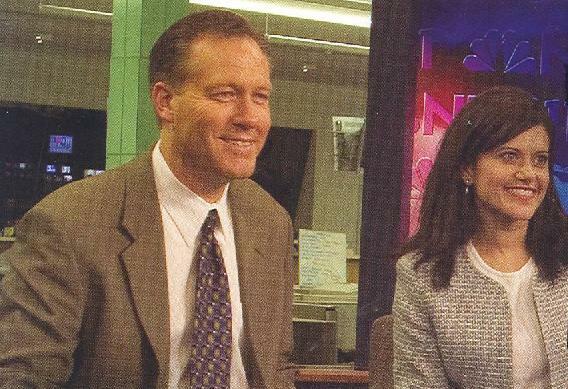 The photograph above documents Channel 33, WFSB-DT, Hartford reception conditions. The station was received from a distance of 46.33 miles. Despite the marginal Channel 33 power spectrum, observed in the center of the screen, the picture quality was excellent, free of interference at the time of testing. 95% of the DTV station operate in the 470 to 800 MHz UHF frequency range, where reception is exposed to inclement weather conditions, such as snow and ice, deposited on trees, as well as on the receiving antenna. Signal levels may suffer an 8 to 10 dB drop. Airplane traffic in Metro areas can also represent a negative factor, blocking reception for a few seconds, or creating out-of-phase reflections, resulting in 4 to 6 dB signal loss. An accumulation of worst case conditions, estimated in the 10 to 13 dB range, could be compensated by a higher gain antenna, increasing tower height and/or the use of an antenna-mounted preamplifier. Should many or all the HDTV affiliates operate from the same antenna tower, a single parabolic antenna can pull-in most or all the stations. In this case, a wide-band UHF preamplifier must be used. The down side: wide-band preamplifiers are exposed to intermodulation beats, created by mobile radio traffic, FM radio station’s harmonics, strong local UHF stations, etc. Insert a 16 dB pad into the path of the received signal. Connect an HDTV tuner, observe picture quality on the TV monitor. In case the signal jumped over the digital cliff, reduce the attenuation to 10 dB. If the pictures still suffer from pixelation or freezing, change the attenuation to 6 dB. This test can confirm the safety margin required for the reception of error-free, reliable HDTV pictures, anticipating marginal reception conditions. Failure prediction technique should provide warning of incipient failure before it becomes a visible problem. That leads to the issue of high level adjacent channel interference caused by powerful DTV stations. The picture above shows drastically changed reception conditions as adjacent Channel 34, New London started operations. 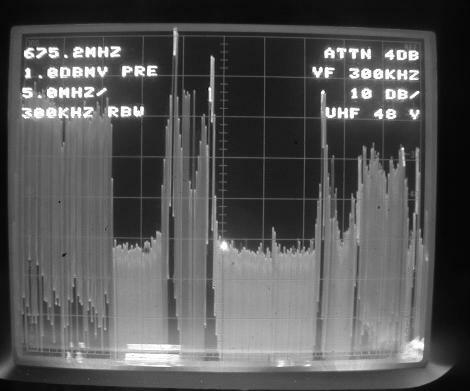 The 45 dB higher Channel 34 adjacent power spectrum completely destroyed the Channel 33, Hartford pictures. 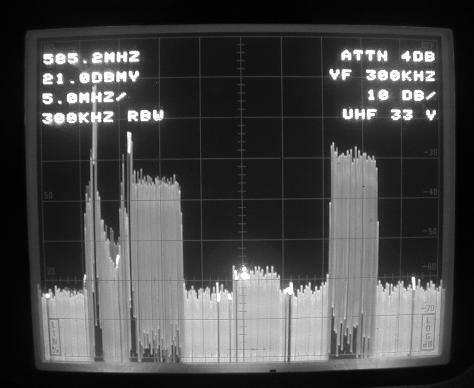 Another DTV reception difficulty is documented by the picture above, taken from the screen of the spectrum analyzer. 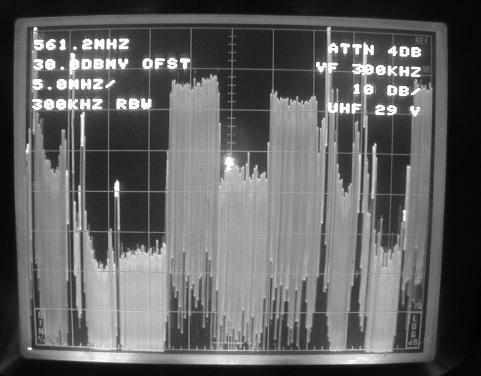 This time the desired Channel 48, WRNN-DT spectrum is in the center of the screen, just above the noise floor of the analyzer, was accompanied by a 50 dB higher Channel 47, New York analog spectrum, dramatically affecting the marginal Channel 48 picture quality. Employing a bandpass filter or trap to eliminate the Channel 47 or Channel 33 interference? UHF bandpass filters and traps lack the selectivity for adjacent channel protection. The only efficient device: a phased-array, forcing a deep radiation pattern null into the direction of the offender, providing 20 to 25 dB interference reduction.